NYC COSMETIC SURGEONS TM: Lip Augmentation with Dermal Fillers or Surgery for "The Perfect Pout"
Lip Augmentation with Dermal Fillers or Surgery for "The Perfect Pout"
One of the most attractive features of a beautiful face are a set of full and healthy lips. They are a synonymous with youth when robust, and a sign of aging as they become thinner and descend with time. Many theories as to the reason behind the attractiveness of lips have emerged over the years, but there are objective findings that are self evident in a set of beautiful lips. 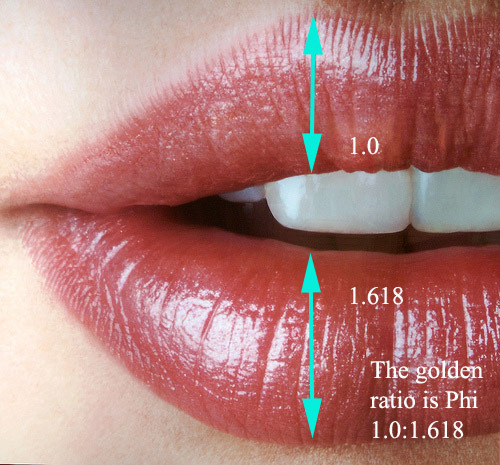 -A ratio of lower to upper lip consistent with the golden number "Phi"
Aging changes the proportions of the lips as they descend and become thinner. 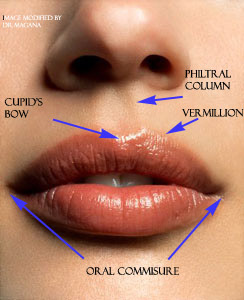 There are variety of methods for lip augmentation available in the armametarium of the cosmetic plastic surgeon. Although no fillers are currently approved by the FDA for lip augmentation, this is a common of label use for non-permanent fillers such as Hyaluronic Acid (HA). HA has the advantage of producing few side effects and being temporary, lasting up to a year. Permanent solutions with methylmethacrylate (PMMA) and ophtalmic grade silicone are also available, but are not as widely used. These permanent fillers may produce secondary complications such as granulomas which may require excision (removal) via surgery or liposuction. Fat grafting has gained popularity because it is autologous (from one's own body) and gives much longer lasting effects. During your initial consult you should ask everything you can about the procedure, make sure your plastic surgeon addresses any concern you may have regarding lip augmentation. Common questions are related to the shape and size of the augmentation, "is the procedure painful?" "How long will it take to recover and for the swelling to go down?" In addition to asking questions, most cosmetic plastic surgeons will evaluate the general health of the patient and take pre-procedure photographs and measurements of your lips. Always tell your Surgeon what medications you take, especially any that may be considered blood thinners, such as aspirin. Although in the scheme of things, lip augmentation is a smaller less invasive procedure than surgery, it will require some downtime afterward. This is something to consider in the busy hussle and bussle of NYC. I recommend 3-4 days to allow the local swelling to subside. There may also be temporary distortion of the lips. It is recommended to apply ice packs to the site to mitigate these side effects. Pain is well controlled by applying filler with local anesthesia and lasts 4-6 hours on average. Control of local discomfort for this procedure is usually addressed with NSAID type medications (eg. Ibuprofen) and patients tend to do well. Unfortunately, not all practitioners are familiar with what conforms with a natural youthfull appearence of attractive lips. Simply adding volume to the lips, often yields displeasing cosmetic results. Technical knowledge as well as a deep understanding of the regional anatomy is needed to acheive a good result. In addition to the previously mentioned, realistic expectations are equally important. Voluptuos lips are a very desirable trait, but the key to a succesfull outcome for maximum effect consists in applying "just enough" volume in just the right places. The safe approach to augmenting lips in terms of a natural appearance consists in being conservative. In this particular case, sometimes "less is more"
*Always ask your plastic surgeon what is your best option when it comes to lip augmentation or any cosmetic procedure. 1. Aesthetic Plastic Surgery. By Sherrell J Aston, Douglas S Steinbrech and Jennifer Walden. Unfortunately, very few plastic surgeons are aware of this, especially non-plastic surgeons who perform lip augmentation. Great article! Perhaps the most popular method of treatment is to enhance the lips, skin fillers, lip injections. This can be painful and local anesthesia is necessary this may be cream or injection anesthesia in lips. I selected to go with Juvederm after I talked to the doctor that performed the treatment on me only because he said alone he acquainted he could plan with Juvederm bigger on the lips. I had Lip implants many years ago and they still look completely natural.I got them to balance my upper lip with my lower one . They have never caused any problems and i would recommend them to anyone who is thinking about the surgery. Dr. Magana is devoted to the art and science of plastic surgery. From a young age, he exhibited a profound appreciation for beauty and symmetry. This led him develop a strong affinity toward special effects movie makeup to which he devoted himself for many years working as a hollywood makeup artist prior to entering the world of cosmetic surgery. By making the transition from art to medicine, Dr. Magana soon realized the fields were intertwined. Knowing he could change people’s lives gave him a new direction and motivation in life. He is unusually talented in that he sees things with the eyes of a sculptor and artist applied with the care and precision that his background in plastic surgery has enabled. Dr. Magana has received training and completed fellowships in general surgery, burns, craniofacial surgery, Aesthetic breast surgery and plastic surgery. He has been recognized for his dedication to excellence, winning the “Kenna Given Award” upon completion of his training in plastic surgery. Does Ф PHI make a beautiful face? Silicone or Saline... What's better for breast Augmentation? Breast Implants and Breast Feeding. Dark Eye Circles.. How to get rid of them.. This Blog is intended primarily for Patient education.This is NOT an active plastic surgery practice website advertisement. This blog's main purpose is to provide information of a general nature related to plastic surgery.